Hello my lovelies! It's Monday again but at least it's a warm and sunny one. It really feels like spring around here. Unfortunately it's still February and there's still a bit of winter ahead of us. Today's nails are all about that. Every year I do a wintery manicure with my beloved Orly Snowcone. Of course I had to do one this year as well. Take a look! 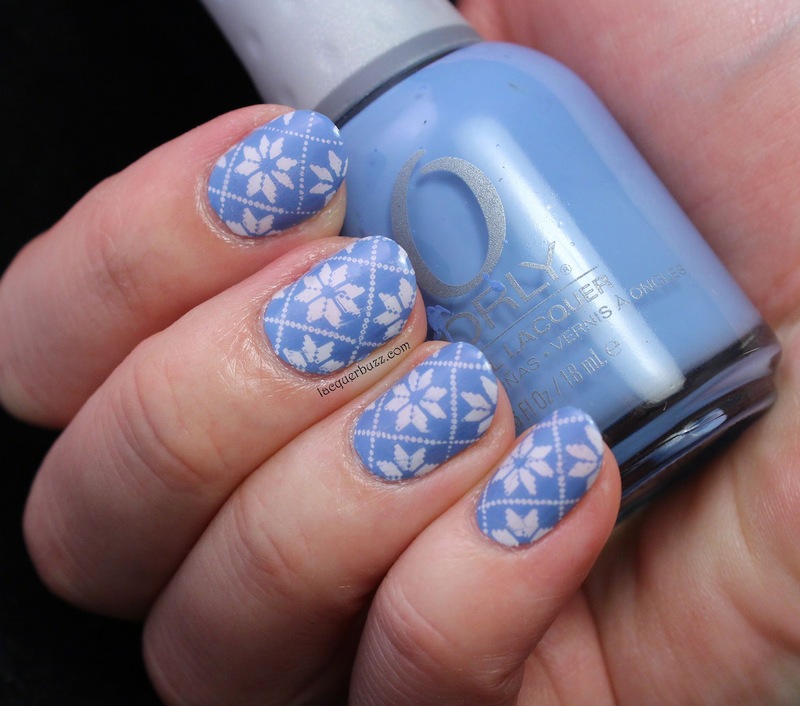 Orly Snowcone is the most perfect cornflower blue creme ever. It's a one coater, which is amazing for such a light color, and applies like a dream. 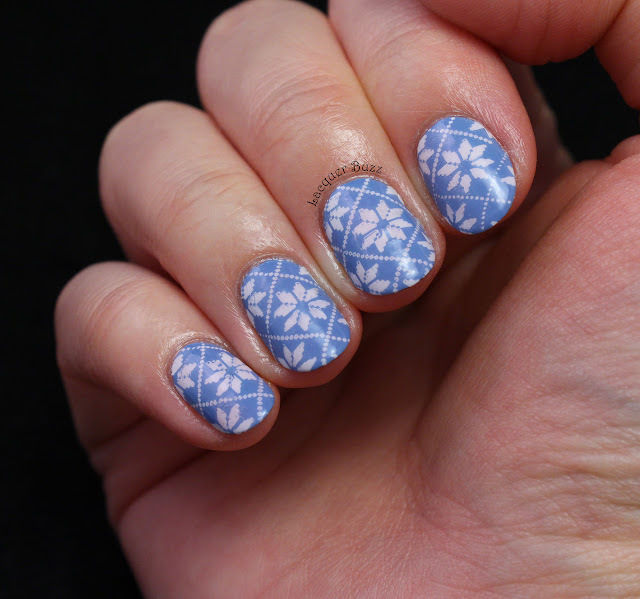 I've owned this polish for a few years and used it a lot, both in the summer and in the cold season, but my favorite way to use it is for snowflake manicures. It just looks amazing with some white stamped on top. This time I settled for an image that resembles a sweater pattern. I picked an image from plate Moyra 02, also called the Fabric Texture plate. I used a white stamping polish and the clear stamper from the Born Pretty Store to stamp and they all worked out wonderfully. The only issue is that I'm out of Seche Vite so I used a bit of Nails Inc Caviar top coat on top. It smudged my design in some places and it also made the white slightly pink because the top coat has a pink hue. There was also some bubbling but you can't see that in the photos. Oh well! This manicure instantly cheers me up when I look at my nails. 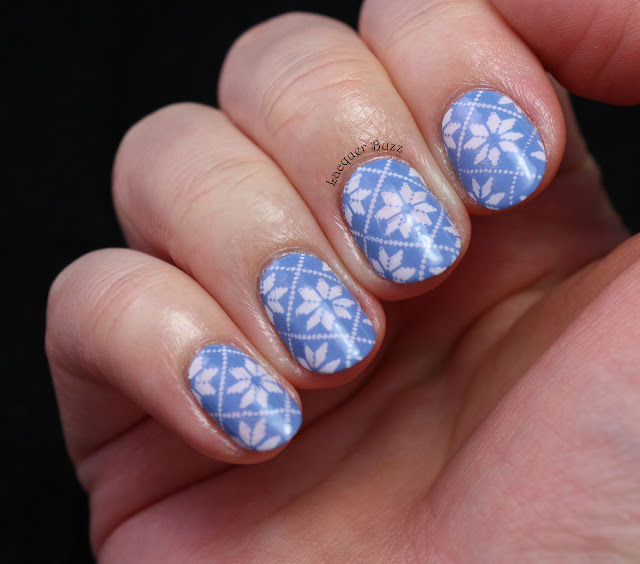 Snowcone will always be one of my favorite polishes even though it's a simple creme. I'm sure I'm gonna keep using it years from now. Hope you like this too! Don't forget that you can check out the rest of today's Monday Blues in the links below!